Evil, beware! The Heavenly Host is here, terrifying and beautiful, and ready to play. The Angelic Player's Guide contains everything you ever wanted to know about angels – their history, their laws, the Choirs they belong to and the Superiors they serve . . . even the dark paths that can lead them to a Fall from Grace. In addition to expanded angel descriptions, it provides the players with four new campaign concepts and several ways to run them. Also included are special rules for playing Outcasts and relievers, and a chapter on angelic reproduction. The Angelic Player's Guide even has a step-by-step "Angel Creation Guide" for quickly and easily generating unique angel characters. 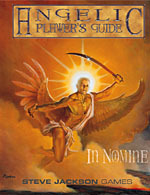 The Angelic Player's Guide is a companion to the In Nomine roleplaying game. Watch your step and don't Fall. We're not quite sure how we got this, but it's very useful: a one-page collection of all the angelic Choir resonance check digit tables from the Core Rules.